This week has been a big one if you're into reading Disney blogs that are closer to the source than me and the rest of the Disnerds that pump out pages of content a second (other people do that. When you do the math, I'm pumping about a page every, oh, two months). That's because, this week, Disney has fully committed itself to the blogging thing that's been popular, since, I don't know, when was the Amy Adams part in Julie and Julia based? Since then. But, as Microsoft will tell you when you ask them about the Zune, better late than never. 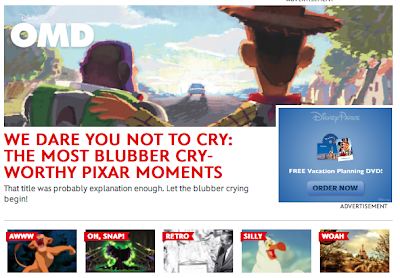 Around Wednesday, Disney launched Oh My Disney, which closely resembles Buzzfeed in style. Now, you could go on a rant about how it so closely resembles Buzzfeed that you could say it completely ripped Buzzfeed's style of. You'd have some sort of valid point, sure, but this is a blog that is only about one thing: Disney. Buzzfeed is about everything, so it's not an unholly ripoff. And hey, Buzzfeed just takes Reddit's content and makes it prettier, so nobody's hands are clean. Except maybe Reddit; its hands are just ugly. If you don't know what Buzzfeed is, 1. That must have been a confusing paragraph you just read through and 2. This one will clear that last one up, and explain how OMD (Disney=acronyms) is a copy of that site. OMD is laid out in a very simple way, much like any other ol' blog. It categorizes its content into five different sections: AWWW, Oh, Snap!, Retro, Silly and Woah, much like on Buzzfeed has content categorized with badges like LOL, omg (a lot like OMD?) wtf? (that last one's a tag, but the question could be asked in regards to the copying) and that kind of thing. The fonts are the same, the simple, clean design are nearly identical, but again, Buzzfeed takes on the whole world with its content, OMD is one thing: Disney. So far, they're doing that one thing well. Disney has always had a problem being "hip" as the kids might say (So depressing that I'm 22 now and not one of the kids. If you're, like 40, sorry that I'm making you feel even older. I'm not looking forward to getting to your stage, either). Hip is about being "with it," and when your a company where you bleed red tape(and in some ways, is a strength. Nobody has a better brad than Disney, and that's because of the red tape), it's hard to produce things that are of the moment. You can also check out Disney Insider, Disney Movies and Disney Music blog. I could make this post more intimidating and take the word count to 11 talking about them, or you could just go read them for yourself. Heck, just go look at OMD for yourself. Why'd you waste your time reading this when you could have just gone straight to OMD?